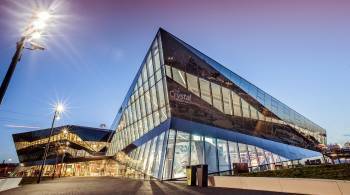 Located in the heart of the Royal Victoria dockland, The Crystal is the world’s most sustainable conference centre. Book one of our 14 flexible meeting spaces today, all customisable to suit your businesses needs, hosting up to 270 guests. Enjoy our award winning facilities and reduce your carbon footprint at the same time. Welcome to the Crystal, a sustainable cities initiative by Siemens. The Crystal in London is home to the world’s largest exhibition on the future of cities, as well as one of the world’s most sustainable buildings and events venues. Meeting, conference and event facilities at the Crystal provide a state of the art setting for everything from workshops to product launches. We have 14 flexible spaces, award winning catering and AV support on site, making the Crystal ideal for events of any size.